Brenthaven Medina Slim Brief Notebook Carrying Case 15 Inch - MochaThe Medina Collection is crafted from the finest materials and designed for the digital lifestyle. Boasting a sleek silhouette, modern design, and unparalleled device protection, the Medina Slim Brief is the ultimate laptop brief for the mobile professional. A dedicated laptop compartment and padded interior pockets keep mobile devices organized and protected at all times. Pair this slim brief with the Collins Laptop Sleeve for added device protection. The Medina Collection is crafted from the finest materials and designed for the digital lifestyle. Boasting a sleek silhouette, modern design, and unparalleled device protection, the Medina Slim Brief is the ultimate laptop brief for the mobile professional. 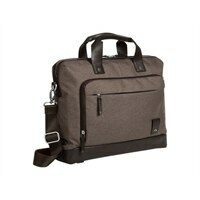 A dedicated laptop compartment and padded interior pockets keep mobile devices organized and protected at all times. Pair this slim brief with the Collins Laptop Sleeve for added device protection.